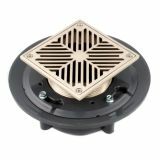 - Fits Assorted Brands EZ Test Style Shower Drains. - 2-7/8" Center-to-Center Screw Holes. 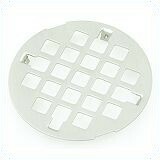 - Fits Frank Pattern Domestic (Instant Set) 20SD Shower Drain. 4-1/2" O.D. Shower Snap-in Strainer. 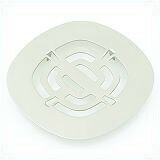 - Fits Fiat Cascade Shower Drains. 3-1/4" O.D. Shower Snap-in Strainer. 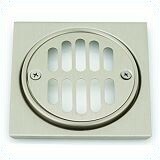 - Fits Casper/Oatey #151 Shower Drain. 4-1/4" O.D. Shower Snap-in Strainer. 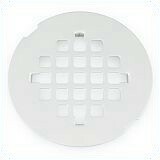 - Fits Assorted Brands Fiberglass Shower Drains. 4" O.D. 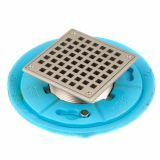 Shower Strainer with Screws. 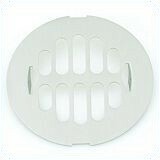 - Fits Plastic Oddities and Other Brands Shower Drains. 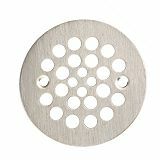 - 3-3/8" Center-to-Center Screw Holes. 4-1/4" O.D. 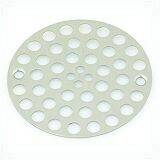 Shower Strainer with Screws. 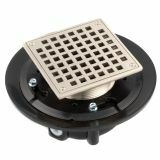 - Fits Plastic Oddities #PFG-600 Series Shower Drains. - 2-5/8" Center-to-Center Screw Holes. 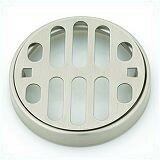 - Fits American Brass and Aluminum Shower Drains. 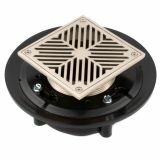 Heavy Duty Floor and Shower Drain with 5" Square Strainer and 2" No-Hub Cast Iron Body. - Recommended in Showers Where a Membrane is Generally Used. 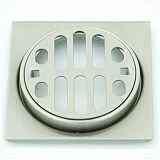 - Unit Has an Adjustable Forged Brass Head and Strainer to Meet Finished Floor Elevations. - Drain is Furnished With a Cast Iron Body and Clamping Collar. - Beveled Clamping Provides Easier Subfloor Installation. 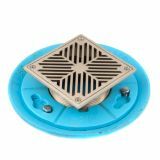 Heavy Duty Floor and Shower Drain with 5" Square Strainer and 2" ABS Body. - Drain is Furnished With an ABS Body and Clamping Collar. 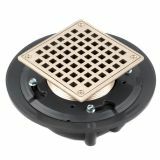 Heavy Duty Floor and Shower Drain with 5" Square Strainer and 2" PVC Body. - Drain is Furnished With an PVC Body and Clamping Collar.